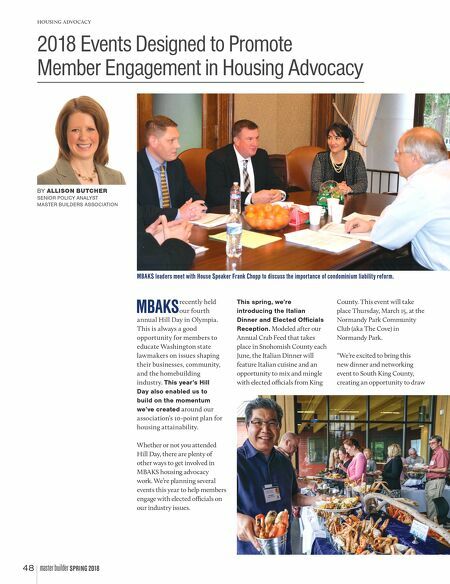 BY ALLISON BUTCHER SENIOR POLICY ANALYST MASTER BUILDERS ASSOCIATION MBAKS recently held our fourth annual Hill Day in Olympia. This is always a good opportunity for members to educate Washington state lawmakers on issues shaping their businesses, community, and the homebuilding industry. This year's Hill Day also enabled us to build on the momentum we've created around our association's 10-point plan for housing attainability. Whether or not you attended Hill Day, there are plenty of other ways to get involved in MBAKS housing advocacy work. We're planning several events this year to help members engage with elected o§cials on our industry issues. 2018 Events Designed to Promote Member Engagement in Housing Advocacy This spring, we're introducing the Italian Dinner and Elected Officials Reception. 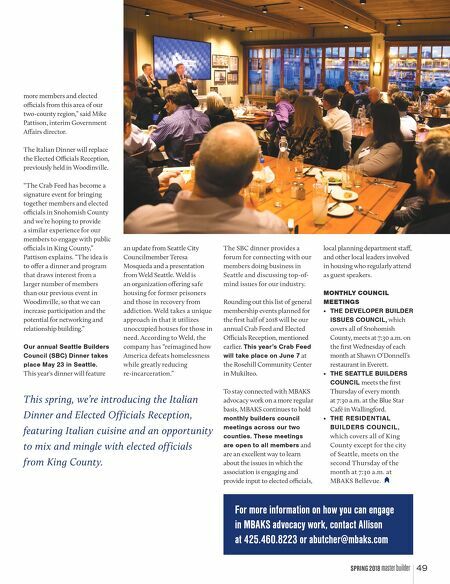 Modeled after our Annual Crab Feed that takes place in Snohomish County each June, the Italian Dinner will feature Italian cuisine and an opportunity to mix and mingle with elected o§cials from King County. This event will take place Thursday, March 15, at the Normandy Park Community Club (aka The Cove) in Normandy Park. "We're excited to bring this new dinner and networking event to South King County, creating an opportunity to draw MBAKS leaders meet with House Speaker Frank Chopp to discuss the importance of condominium liability reform. 48 master builder SPRING 2018 • "
Get Excited for the Sales & Marketing Council in 2018!